Deformable particles like cells can fill complex geometries more efficiently than fixed shapes like circles. With the new deformable particle model introduced by Shattuck and O'Hern, researchers can also “simulate” deformable systems more efficiently and accurately. 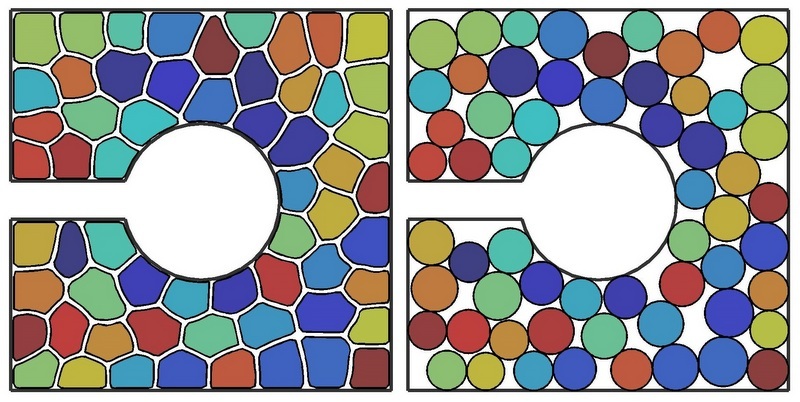 The computational model developed by Shattuck and lead investigator from Yale, Corey O’Hern, tracks points on the surfaces of polygonal cells. Each surface point moves independently, in accordance with its surroundings and neighboring particles, allowing the shape of the particle to change. It is more computationally demanding than current simulations, but necessary to correctly model particle deformation. “We now have an efficient accurate computational model to investigate how discrete, deformable particles pack,” Shattuck said. It also allows researchers to easily adjust cell-cell interactions, consider directed motion, and can be used for both 2D and 3D systems. Since 1847, The City College of New York has provided a high quality and affordable education to generations of New Yorkers in a wide variety of disciplines. CCNY embraces its role at the forefront of social change. It is ranked #1 by The Chronicle of Higher Education out of 369 selective public colleges in the United States on the overall mobility index. This measure reflects both access and outcomes, representing the likelihood that a student at CCNY can move up two or more income quintiles. In addition, the Center for world University Rankings places CCNY in the top 1.2% of universities worldwide in terms of academic excellence. More than 16,000 students pursue undergraduate and graduate degrees in eight professional schools and divisions, driven by significant funded research, creativity and scholarship. CCNY is as diverse, dynamic and visionary as New York City itself. View CCNY Media Kit.